QUICK LOOK AT CURRENT PUBLIC CLASSES. MONDAY NIGHTS: Nia, Om Namo Studio, located at 21 Belmont Street, Cambridge, MA. WEDNESDAY MORNINGS: Nia resumes on February 6, 2019 at the Dance Complex. NOTE LOCATION CHANGE, Location is now at 536 Mass Avenue, Central Square, Cambridge, MA. Camp Fareta is a residential workshop hosted by Youssouf Koumbassa, a master dancer, choreographer, and teacher from Guinea, West Africa, and featuring many other master dancers and drummers from Guinea, Mali, Senegal, the Congo, and other countries. 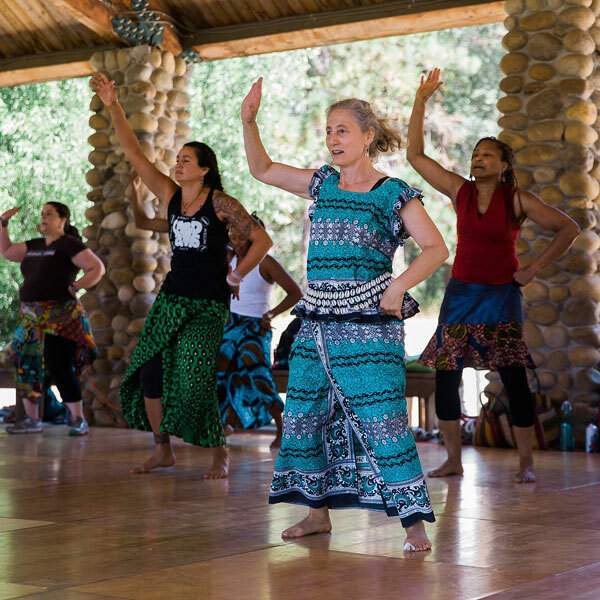 It is a total immersion in West African drum and dance that started back in 2006 and is held annually at a beautiful setting in the southern Sierras of California each summer.